"Sky Warrior" redirects here. For the UAV formerly known as the Sky Warrior, see General Atomics MQ-1C Gray Eagle. Early in World War II, the U.S. Navy began to explore the concept of a jet-powered aircraft operating from aircraft carriers. Success encouraged further development of the concept, and early in the post war years, the U.S. Navy began to consider jet power as a possible means of operating carrier-based aircraft that were large enough to provide a strategic bombing capability. In January 1948, the Chief of Naval Operations issued a requirement to develop a long-range, carrier-based attack plane that could deliver a 10,000 lb (4,536 kg) bomb load or a nuclear weapon. The aircraft was planned to operate from the proposed United States-class "supercarriers," much larger than existing carriers, and the specification set a target loaded weight of 100,000 lb (45,500 kg). Ed Heinemann, chief designer of the Douglas Aircraft Company, later to win fame for the A-4 Skyhawk, fearing that the United States-class was vulnerable to cancellation, proposed a significantly smaller aircraft of 68,000 lb (31,000 kg) loaded weight, capable of operating from existing carriers. The contract that the U.S. Navy awarded to the Douglas Aircraft Company on 29 September 1949 led to the development and production of the A3D Skywarrior. The prototype XA3D-1 first flew on 28 October 1952. Considerable development problems, largely with the original engines, delayed the introduction of the Skywarrior until spring 1956. The A-3 was, by far, the largest and heaviest aircraft ever designed for routine use on an aircraft carrier, though ironically it was the smallest proposal among other proposals that could only be deployed on even larger carriers not yet in service. Because of its cumbersome size, and less-than-slender profile, it was nicknamed "The Whale". Production ceased in 1961. The Skywarrior had a 36° degree swept wing and two Pratt & Whitney J57 turbojet engines. Early prototypes had used the intended Westinghouse J40, a powerplant that proved to be disastrous and was subsequently canceled. The turbojets could be supplemented by a provision for twelve 4,500 lbf (20 kN) thrust JATO bottles. The aircraft had a largely conventional semi-monocoque fuselage, with the engines in underwing nacelles. Flight controls were hydraulic, and for storage below deck, the A-3's wings folded outboard of the engines, lying almost flat, and its vertical stabilizer was hinged to starboard. Capacious internal fuel tanks provided long range. The early A-3 variants had a crew of three: pilot, bombardier/navigator (BN) and crewman/navigator (aka: third crewman). An unusual cockpit configuration was incorporated with the three crew sitting under a framed canopy. In the raised compartment, the pilot and bombardier/navigator sat in a side-by-side arrangement with the pilot's station on the port side having full flight controls. On initial variants, a third crew member, who also acted as a gunner for the twin tail-mounted 20mm cannon that briefly equipped the original bomber version of the A3D/A-3A (removed and replaced by ECM equipment), sat behind the pilot in an aft-facing seat. The third crewman station had the sextant for celestial navigation and the defensive electronic counter measures equipment. Later electronic reconnaissance variants could accommodate a crew of seven with the flight crew consisting of a pilot, co-pilot and navigator plus four electronic systems operators occupying stations in the former bomb bay in the spacious fuselage. Efforts to reduce weight to make the aircraft suitable for carrier operations had led to the deletion of ejection seats during the design process for the Skywarrior, based on the assumption that most flights would be at high altitude. A similar arrangement with an escape tunnel had been used on the F3D Skyknight. Aircrews began joking morbidly that "A3D" stood for "All Three Dead". 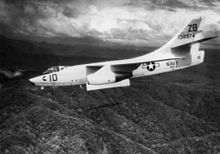 (In 1973, the widow of a Skywarrior crewman killed over Vietnam sued the McDonnell Douglas Aircraft Company for not providing ejection seats in the A-3.) In contrast, the US Air Force's B-66 Destroyer, not subject to the weight requirements for carrier operations, was equipped with ejection seats throughout its service life. The documented history of mechanical failures in the A3D / A-3 showed a rate well above average. While there were magazine articles that conjectured that the safety problem was compounded by assigning weaker pilots to slower jets like the A-3, during their heyday, Skywarrior pilots were often "best-of-the-best" and were, with few exceptions, senior pilots with a minimum of 1500 hours jet time, due to its critical nuclear strike mission and the difficulty of bringing such a large plane aboard, especially at night on the smaller carriers. 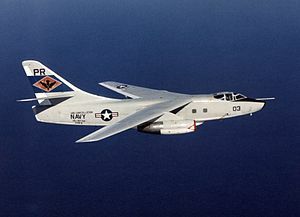 Originally, the Skywarrior bombers were assigned to all attack carriers, which included: the WWII-era Essex class and the (just) postwar Midway class. The Skywarrior could carry up to 12,000 lb (5,443 kg) of weaponry in the fuselage bomb bay, which in later versions was used for sensor and camera equipment or additional fuel tanks. An AN/ASB-1A bomb-director system was initially installed, later replaced by a revised AN/ASB-7 with a slightly reshaped nose. Defensive armament was two 20mm cannons in a radar-operated tail turret designed by Westinghouse, soon removed in favor of electronic counter measure equipment. 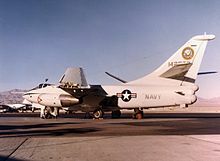 Although some bombing missions would be carried out early in the Vietnam war, most bombing would be carried out by more nimble attack and fighter bombers, and the Skywarrior would serve mostly as a tanker and electronic warfare support aircraft. Prior to the initial operational capability of the U.S. Navy's Polaris-armed Fleet Ballistic Missile submarines, the A-3 was the Navy's critical element in the U.S. nuclear deterrent. Squadrons were established in two Heavy Attack Wings (HATWINGs), with one wing initially established at NAS North Island, California before relocating to NAS Whidbey Island, Washington in December 1957 while the other wing was initially established at NAS Jacksonville, Florida before relocating to NAS Sanford, Florida. The wing at NAS Whidbey Island would disestablish in 1959 but the squadrons which had made up the wing would later transition to the EKA-3B variant, eventually forming the nucleus for the Navy's Grumman EA-6B Prowler community, while the wing at NAS Sanford would convert to the A3J Vigilante (later A-5A) in the nuclear heavy attack mission, followed by conversion to the RA-5C and transition to the reconnaissance attack mission. The Vigilante wing would also continue to retain a small number of TA-3B aircraft for training Naval Flight Officers in the Vigilante's radar and navigation systems. 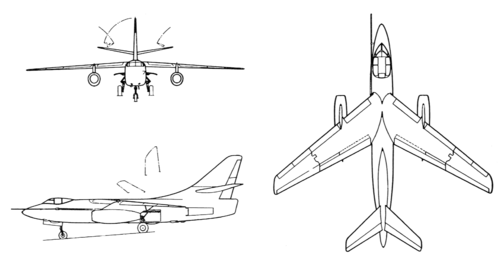 The Skywarrior's strategic bombing role faded after 1964, briefly being complemented by the A3J Vigilante. Soon afterward, the Navy abandoned the concept of carrier-based strategic nuclear weaponry for the successful Polaris missile-equipped Fleet Ballistic Missile submarine program and all A-5As were converted to the RA-5C Vigilante reconnaissance variant. Many A-3B's were converted to a combination tanker-electronic warfare aircraft. A VAH-4 A-3B from USS Oriskany dropping a Mk 83 bomb, 1965. 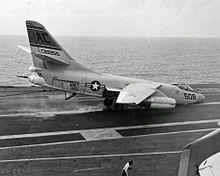 A black RA-3B from VAP-61 aboard USS Constellation, 1967. Skywarriors saw some use in the conventional bombing and mine-laying role (A-3B) during the Vietnam War from 1964 through 1967, often to deliver Mk84 900 kg (2000 lbs) bombs. The A-3 found subsequent service in the tanker (KA-3B), photographic reconnaissance (RA-3B), electronic reconnaissance (EA-3B), and electronic warfare (ERA-3B, EKA-3B) roles. For most of the Vietnam War, EA-3Bs of Fleet Air Reconnaissance Squadron 1 (VQ-1) flew from Da Nang Air Base in South Vietnam, providing continuous electronic reconnaissance capability over the area, including the Ho Chi Minh Trail and all the way north to Haiphong harbor. This was known as VQ-1 Det.B. The aircrew and ground support personnel were temporarily assigned from their home base at NAS Atsugi, Japan and after 1970, NAS Agana, Guam. After Det B was disestablished, VQ-1 provided detachments of two EA-3B aircraft that deployed with Western Pacific and Indian Ocean (WESTPAC/IO) bound aircraft carrier battle groups up until the late 1980s when it was replaced by the Lockheed ES-3A Shadow. In addition, a version of the A-3B was modified into the RA-3B and used in Vietnam as a photo reconnaissance aircraft. Heavy Photographic Squadron 61 (VAP-61) at NAS Agana, Guam and sister squadron VAP-62 at NAS Jacksonville, Florida furnished crews and flew out of Da Nang AB performing mapping and intelligence gathering flight over the Southeast Asia area. With 12 camera stations the RA-3B was well equipped to perform cartographic mapping of areas where no detail maps existed. With IR gear installed, the RA-3B was used at night to monitor the movement of troops down roads and trails in Laos. Other locations included Det Tango at Don Muang Royal Thai Air Force Base in Bangkok, Thailand, Det Southpaw at RAAF Base Townsville, Australia, as well as work out of Osan Air Base, South Korea. An EKA-3B from VAQ-135 refueling an VF-211 F-8J off Vietnam, 1972. During the Vietnam War, the A-3 attack aircraft were modified to KA-3B tankers while some were modified into a multimission tanker variant, the EKA-3B, which was a real workhorse for the carrier air wing. Electronic jamming equipment was added without removing tanker capability so the EKA-3B could jam enemy radar while waiting to refuel tactical aircraft. Eventually, the EKA-3B was replaced by the smaller dedicated Grumman KA-6D Intruder tanker, which although it had less capacity and endurance, was deployed in greater numbers within the carrier's air wing. Two additional Naval Reserve units were established in the early 1970s as air refueling squadrons, VAQ-208 and VAQ-308, at NAS Alameda, California. Both units operated aircraft with electronic warfare equipment removed and were redesignated as KA-3Bs. VAK-208 and VAK-308 were decommissioned in the early 1990s. The EA-3 variant was used in critical electronic intelligence (ELINT) roles operating from aircraft carrier decks and ashore supplementing the larger Lockheed EP-3. Its last service was as an ELINT platform during Desert Storm. The EA-3B variant was modified for electronic intelligence against the Warsaw Pact. Missions were flown around the globe beginning in 1956, with the U.S. Air Force EB-47 Stratojet flying a similar mission. The EA-3B carried a crew of seven, with flight crew of three in the cockpit and an Electronic Warfare Officer and three electronic systems operators/evaluators in the converted weapons bay. It offered unique electronic reconnaissance capabilities in numerous Cold War-era conflicts and the Vietnam War. EA-3Bs remained in service long enough to participate in the first Gulf War in 1991. The Skywarrior was out of Navy service by September 1991, with the last fleet Skywarriors retiring on 27 September 1991. U.S. Navy RDT&E units, notably Naval Air Systems Command (NAVAIR) activities at NAS Point Mugu and NAWS China Lake, attempted to retain their A-3 testbeds. This plan ultimately failed when Vice Admiral Richard Dunleavy, as Deputy Chief of Naval Operations for Air Warfare and an old A-3 bombardier/navigator himself, made the final decision to retire the type. The A-3 had been used as a civilian operated testbed for many years before the type's retirement from US Navy, with Hughes Aircraft Company using the type as a testbed for developing the weapons system for the General Dynamics–Grumman F-111B and Grumman F-14 Tomcat, with Westinghouse and Raytheon also using the A-3 as a testbed. On the retirement of the type from US Navy service in 1991, the US Navy decided to end logistic support for the civilian operated testbeds. Rather than abandon the A-3, Hughes, Westinghouse and Raytheon agreed to acquire the remaining A-3s and spares from the Navy, allowing their test fleets to continue to operate and saving the US Navy the cost of storage and disposal. As the plan matured, two other contractors, Thunderbird Aviation and CTAS also elected to participate in similar agreements, with eleven A-3s spread between the five operators. The fleet spares from ASO were distributed between the contractors evenly, and warehouses were emptied all over the US. Due to misunderstandings and reorganizations within the US Navy, the worldwide ASO assets were scrapped, not getting to the contractors. In early 1993, CTAS decided that they no longer had use for their aircraft, and Hughes had several programs needing additional assets. In early 1994, a US Air Force program decided to modify an A-3 for F-15 radar tests, and the only available airframe was stored at NAS Alameda since the fleet shutdown. Hughes added that aircraft to the bailment, and ferried the aircraft to Van Nuys for modifications. An entire nose section was removed from a stricken F-15B at AMARC at Davis-Monthan AFB, Arizona and grafted onto the front of the aircraft. Racks and equipment were installed in the cabin, and the aircraft was used by Hughes and the USAF for F-15 software development. In 1994, Westinghouse decided to terminate their agreement with the Navy, and Thunderbird added their aircraft to the Thunderbird bailment. In 1996, Thunderbird Aviation went into receivership, and Hughes, through mutual cost savings to the government, added the Thunderbird assets to the contract, prepping them for ferry at Deer Valley airport, and relocating them to Mojave, California and Tucson, Arizona for long-term storage. In December 1996, Raytheon bought the aerospace units of Hughes Aircraft Company. Hughes Aeronautical Operations, now a part of Raytheon Systems, continued to operate the A-3s from their base at Van Nuys Airport, California. These aircraft have participated in several military air shows, telling visitors that the plane continued to be valuable for its load capacity compared to corporate jets, and its performance compared to small airliners. On 30 June 2011, the last flyable EA-3B, BuNo 144865 / FAA registration N875RS, a Raytheon aircraft, arrived at NAS Pensacola, Florida for retirement and display at the National Naval Aviation Museum. An A3D-1 of Heavy Attack Squadron 3 (VAH-3) on the USS Franklin D. Roosevelt in 1957. VAH-3 became the A3D/A-3 Replacement Air Group (RAG) squadron for the Atlantic Fleet in 1958. 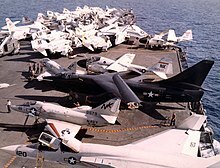 Note: under the original Navy designation scheme, the Skywarrior was designated A3D (third Attack aircraft from Douglas Aircraft). In September 1962, the new Tri-Services designation system was implemented and the aircraft was redesignated A-3. Where applicable, pre-1962 designations are listed first, post-1962 designations in parentheses. XA3D-1: Two prototypes with Westinghouse J40 turbojets, no cannon in tail turret. YA3D-1 (YA-3A): One pre-production prototype with Pratt & Whitney J57 engines. Later used for tests at the Pacific Missile Test Center. A3D-1 (A-3A): 49 initial production versions, serving largely in developmental role in carrier service. A3D-1P (RA-3A): One A3D-1 converted as a prototype for the A3D-2P with camera pack in the weapon bay. A3D-1Q (EA-3A): Five A3D-1s converted for the electronic reconnaissance (ELINT) role, with ECM equipment and four operators in weapons bay. A3D-2 (A-3B): Definitive production bomber version, with stronger airframe, more powerful engines, slightly larger wing area (812 ft²/75 m² versus 779 ft²/72 m²), provision for in-flight refueling reel for tanker role. Final 21 built had new AN/ASB-7 bombing system, reshaped nose; deleted tail turret in favor of electronic warfare installation. A3D-2P (RA-3B): 30 photo-reconnaissance aircraft with weapons bay package for up to 12 cameras plus photoflash bombs. Increased pressurization allowed camera operator to enter the bay to check the cameras. Some retained tail guns, but most were later converted to ECM tail of late A-3Bs. A3D-2Q (EA-3B): 24 electronic warfare versions with pressurized compartment in former weapon bay for one Electronic Warfare Officer and three ESM operators, various sensors. This was the longest serving version of the "Whale" and the most widely known throughout the fleet. Some early models had tail guns, but these were replaced with the ECM tail. The EA-3B was assigned to fleet reconnaissance squadrons VQ-1 (Japan and later Guam) and VQ-2 (Rota. Spain) where they flew alongside the Lockheed EC-121 Warning Star and the EP-3B and EP-3E. It served in the fleet for almost 40 years, and was replaced by the ES-3A Shadow flown by two Fleet Air Reconnaissance (VQ) squadrons: VQ-5 at NAS North Island, California and VQ-6 at NAS Cecil Field, Florida. They were decommissioned less than 10 years after their commissioning due to budget constraints. A3D-2T (TA-3B): 12 bomber-trainer versions. Five later converted as VIP transports (two redesignated UTA-3B). KA-3B: 85 A-3B bombers refitted in 1967 for the tanker role with probe-and-drogue system in place of bombing equipment. EKA-3B: 34 KA-3B tankers refitted for dual Electronic countermeasures (ECM)/tanker role, with electronic warfare equipment and tail fairing in place of rear turret. Most were converted back to KA-3B configuration (with no ECM gear) after 1975. A VA-3B used by the Chief of Naval Operations at Nellis AFB. ERA-3B: Eight RA-3Bs converted as electronic aggressor aircraft (primarily for war-at sea exercises) with ECM in new extended tail cone, ventral "canoe" fairing, cylindrical fairing atop vertical fin, and two detachable ram-air turbine powered ALQ-76 countermeasures pods (one under each wing). Added chaff (radar countermeasure) dispensers (streaming chaff from the tail cone and two self-protection chaff dispensers on the aft fuselage) and four ram-air turbines (two per side) to power the equipment located in the former bomb bay. Crew increased to four: pilot, navigator, crew chief, and Electronic Countermeasures Officer (ECMO) with one generally unused "jumpseat" in the aft crew compartment (formerly the weapon bay). There was no equipment position for a second Electronic Countermeasures Officer or enlisted crewman in the converted weapon bay. The "jump seat" was used for qualified instructor ECMOs training new ECMOs, for guest observers on operational flights, or for passengers during operational deployment transits. While the ERA-3B could withstand the stresses of a cable arrested landing, the ALT-40 and ALR-75 equipment in the former bomb bay was not stressed to withstand a catapult launch and the ERA-3B was never deployed aboard carriers. The ERA-3B served with VAQ-33 and later with VAQ-34. NRA-3B: Six RA-3Bs converted for various non-combat test purposes. VA-3B: Two EA-3B converted as VIP transports. Both aircraft were assigned to the Chief of Naval Operations flying from Andrews AFB in Washington, DC. NTA-3B: One aircraft converted by Hughes/Raytheon used to test radar for the F-14D Tomcat. 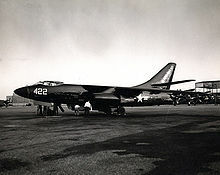 The U.S. Air Force ordered 294 examples of the derivative B-66 Destroyer, most of which were used in the reconnaissance and electronic warfare roles. The Destroyer was fitted with ejection seats. VAP-61 based at NAS Agana, Guam (now decommissioned). 125413 – Fulton County Airport, Johnstown, New York. 135434 – Restored in September 2011 by members of Naval Air Reserve Patrol Squadron 65 (VP-65) based at Naval Air Station Point Mugu. Aircraft displayed at the Edwards Air Force Flight Test Center Museum, Edwards AFB, California. 135418 – National Naval Aviation Museum, NAS Pensacola, Florida. 130361 – Pima Air and Space Museum (adjacent to Davis-Monthan AFB), Tucson, Arizona. 142246 – New England Air Museum, Windsor Locks, Connecticut. 146448 – National Cryptologic Museum, National Vigilance Park, Fort Meade, Maryland. 146457 – Patriots Point Naval and Maritime Museum, Mount Pleasant, South Carolina (previously displayed in front of Daum Hall Bachelor Officers Quarters, Naval Station Rota, Spain). 138944 – U.S.S. Lexington Museum, Corpus Christi, Texas. 147648 – NAS Key West, Boca Chica Key, Florida. 147666 – Oakland Aviation Museum in Oakland, California. 142630 – Celebrity Row, Davis-Monthan AFB, Tucson, Arizona. EKA-3B Bu# 142251 at the USS Midway Museum, San Diego, California. 142251 – USS Midway Museum, San Diego, California. 144865 – National Naval Aviation Museum, NAS Pensacola, Florida. 144825 – A-3 Skywarrior Whidbey Memorial Foundation, NAS Whidbey Island, Washington. A3D-2Q (EA-3B Bu#146453) on display at the Vintage Flying Museum, Meacham Field, Fort Worth, Texas. 146453 – Vintage Flying Museum, Meacham Field, Fort Worth, Texas. 138965 – Yanks Air Museum, Chino, California. 144843 – Castle Air Museum (former Castle AFB), Atwater, California. 144867 – Pacific Aviation Museum, Pearl Harbor, Honolulu, Hawaii. ^ Winchester 2006, p. 74. ^ O'Rourke, G.G., CAPT USN. "Of Hosenoses, Stoofs, and Lefthanded Spads". United States Naval Institute Proceedings, July 1968. ^ a b c d Winchester 2006, p. 75. ^ Polmar 1988, pp 50–51. ^ Francillon 1979, pp. 493–494. ^ a b Francillon 1979, p. 494. ^ a b Polmar 1988, p. 53. ^ "A-3 dispositions, accident reports." Archived February 1, 2011, at the Wayback Machine Click ready room. Retrieved: 28 July 2012. ^ "National Vigilance Park - Naval Security Group". www.silent-warriors.com. ^ Munzel 2001, pp. 73–75. ^ Munzel 2001, p. 75. ^ "A picture of the modified A-3 currently (2011) based at Van Nuys." air-and-space.com. Retrieved: 29 June 2011. ^ "Aircraft N875RS (1960 Douglas EA-3B Skywarrior C/N 12111) Photo by Sergey Ryabtsev (Photo ID: AC955931)". www.airport-data.com. ^ "A-3 Skywarrior/125413." aerialvisuals.ca Retrieved: 24 June 2015. ^ "A-3 Skywarrior/135434." Archived 2017-01-02 at the Wayback Machine aerialvisuals.ca Retrieved: 24 June 2015. ^ "A-3 Skywarrior/135418." National Naval Aviation Museum. Retrieved: 24 June 2015. ^ "A-3 Skywarrior/130361." Pima Air and Space Museum. Retrieved: 24 June 2015. ^ "A-3 Skywarrior/142246." New England Air Museum. Retrieved: 24 March 2013. ^ "A-3 Skywarrior/146448." National Cryptologic Museum. Retrieved: 25 March 2013. ^ "A-3 Skywarrior/146457." Patriots Point Museum. Retrieved: 25 March 2013. ^ Hills, Waring. < " 'Whale' to arrive on Yorktown's flight deck Friday! "[permanent dead link] Patriot Point, 1 July 2010. ^ "Item - National Naval Aviation Museum". navalaviationmuseum.org. ^ "A-3 Skywarrior/138944." USS Lexington Museum. Retrieved: 25 March 2013. ^ "A-3 Skywarrior/147648." aerialvisuals.ca Retrieved: 24 June 2015. ^ "A-3 Skywarrior/147666." Oakland Aviation Museum. Retrieved: 25 March 2013. ^ "A-3 Skywarrior/142630." aerialvisuals.ca Retrieved: 24 June 2015. ^ "A-3 Skywarrior/142251." USS Midway Museum. Retrieved: 25 March 2013. ^ "A-3 Skywarrior/144865." National Naval Aviation Museum. Retrieved: 24 June 2015. ^ "A-3 Skywarrior/144825. ", A-3 Skywarrior memorial dedication, 26 October 2017, Retrieved: 28 October 2017. ^ "A-3 Skywarrior/146453." Vintage Flying Museum. Retrieved: 24 June 2015. ^ "A-3 Skywarrior/138965." Archived 2015-09-07 at the Wayback Machine Yanks Air Museum. Retrieved: 25 March 2013. ^ "A-3 Skywarrior/144843." Archived April 7, 2013, at the Wayback Machine Castle Air Museum. Retrieved: 25 March 2013. ^ "A-3 Skywarrior/144867." Pacific Aviation Museum Pearl Harbor. 13 March 2012. Retrieved: 15 March 2012. ^ Francillon 1979, p. 501. ^ Francillon 1979, p. 496. ^ a b Polmar 1988, p. 57. Donald, David and Jon Lake, eds. Encyclopedia of World Military Aircraft. Westport, Connecticut: AIRtime Publishing, 1996. ISBN 1-880588-24-2. Munzel, Mark. "Last of the Great 'Whales': Civilian-Operated, Test-Bed Douglas A-3s". Air Enthusiast, No. 93, May/June 2001, pp. 72–77. ISSN 0143-5450. Wikimedia Commons has media related to Douglas A-3 Skywarrior.